DUI in North Carolina is a highly structured area of the law. An experienced criminal defense lawyer can help you keep it together and help find the assistance you need to get back on the road. Shoplifting, breaking and entering, and embezzlement fall under the umbrella of property crime. Evidence based charges require knowledgeable investigation for strong criminal defense. The importance of competent criminal defense lawyer representing you at your initial bond hearing cannot be stressed enough. A bond set higher than you are able to pay keeps you in jail, cutting off your ability to work and answer to the responsibilities in your life. If you or a loved one have been arrested, call Jason Wilson first. The Criminal Court system in North Carolina is clogged and overburdened. Even the most minor of charges can take months and months to come to resolution. Having guidance through and an understanding of the criminal process will alleviate stress and allow you to focus your attention on improving your life. Most criminal matters are negotiated and result in a plea to a reduced charge or dismissal. Prosecutors strategically enhance criminal charges for the purpose of negotiating to the actual offense. If a plea resolution can be reached that is the best interest of his clients, Jason will negotiate it. If not, Jason Wilson is first and foremost a criminal trial lawyer. Unfortunately, the reality of our culture is that law enforcement is not always correct, and sometimes worse – without the intent to serve and protect. When this happens, it is often important to have your day in court. Jason is a trial lawyer focusing his practice in the area of criminal defense. If you are under investigation, if law enforcement wants to speak with you, or if you have been charged with a criminal offense, a competent, experienced criminal defense attorney can make all the difference in the outcome of your charges – and maybe whether you get charged at all. Call Jason Wilson in Asheville, NC to discuss your circumstances. The prosecution of criminal charges in Western North Carolina can be burdensomely slow and tedious. A main benefit of having competent criminal defense representation is having assistance in navigating the court process. From initial bond hearings to plea negotiation and all the way to trial, Jason is with you every step. 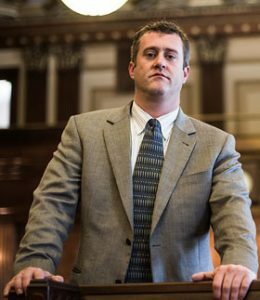 When plea negotiations fail, Jason Wilson is the criminal trial attorney you need in your corner. Consultation regarding any criminal charge is free.